First, the whole project grew out of a rejection: When filmmaker Dyllan McGee approached Gloria Steinem about doing a film on her life, she was told, “You can’t tell the story of the women’s movement through the story of one person.” McGee heard that as a No. So she and her team regrouped and Makers was born. As a result, not only do we get to hear from Steinem, but Makers lets us hear from scores of other trailblazing women who are transforming our world. The three-part, three-hour documentary premiered on PBS . You can stream the entire program at makers.com. 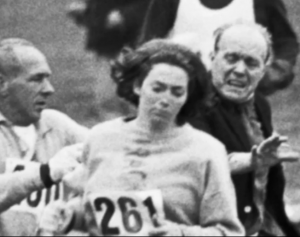 It starts with the remarkable story of Katherine Switzer, the first woman to run the Boston Marathon, then follows the next 50 years of the women’s movement. Just as great as the documentary, is an inspiring library of video interviews with around 160 American women—many well known, others worth discovering. The pioneers in this largest video assemblage of women’s stories represent all parts of society. Fascinating clips from the likes of Marian Wright Edelman, Sheryl WuDunn, Oprah Winfrey, Christiane Amanpour, Nora Ephron… way to many to mention. Ruth Bader Ginsburg shares the challenges she faced as a law student at Harvard and as she began to move for fuller rights for women. Makers: Women Who Make a Difference. And the largest video collection of women’s stories.